As I’m sure you know, entrepreneurship can be a roller-coaster of highs and lows. Our guest, Rachel Carroll shares her journey and how she used Profit First to not only ensure stability but achieve her personal and business goals. Welcome to episode 237 of the Profit First Podcast! Rachel is a Certified Neuromuscular Therapist and is the owner and founder of The Neuromuscular Studio. She has been a practicing, licensed massage therapist since 2002. In 2003 she began her private practice and founded The Neuromuscular Studio, concentrating her efforts on rehabilitating athletes and treating the injuries of performing artists. Her areas of expertise are post-surgical, prenatal pain conditions, motor vehicle accident injuries, shoulder pain, hip pain, and migraines. It is her own experience with music, the performing arts, and injuries that originally inspired her career in massage therapy. Rachel holds a Bachelor of Music in Bassoon Performance from Arizona State University where she studied with Dr. Jeffrey Lyman. In her Junior year of study as a performance major, she developed severe tendonitis as a result of the repetitive stress and playing demands of her degree. After exhausting traditional options with little relief she chose to look at alternative therapies, including massage, to alleviate her pain and restore her performance. The treatments and their success prompted Rachel to pursue a career in massage therapy. Over the years her specialties in soft tissue treatment for injuries and medical conditions has expanded to also include concussion, prenatal and postpartum, post-surgical orthopedic and spine rehabilitation, and motor vehicle accident injuries. Her particular post-surgical rehab interests are Cesarean Section and Hip Arthroscopy (hip labrum), for which she has developed soft tissue and scar release treatment protocols. 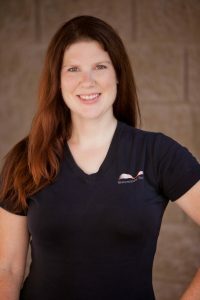 She is currently an Arizona State Licensed Massage Therapist, a Certified Neuromuscular Therapist under Judith DeLany and Neuromuscular Therapy American Version. She has also been a member of the exam item writing panel for the National Certification Board for Massage Therapy and Bodywork, writing questions for the National exam. Abby Connect – So many valuable opportunities are lost when potential clients reach out and get voicemail or an automated system. Abby Connect provides you with world-class Las Vegas-based receptionists trained to take your calls at a fraction of the cost of in-house staff. Hear the difference Abby Connect can make; get a no-obligation free trial and $95 off your first bill at abbyconnect.com/profitfirst or call 833 – ABBYWOW and mention Entrepreneurship Elevated Podcast.